For centuries, Christians have walked to special places, to take time to be with God and allow God the time and space to work in their lives. 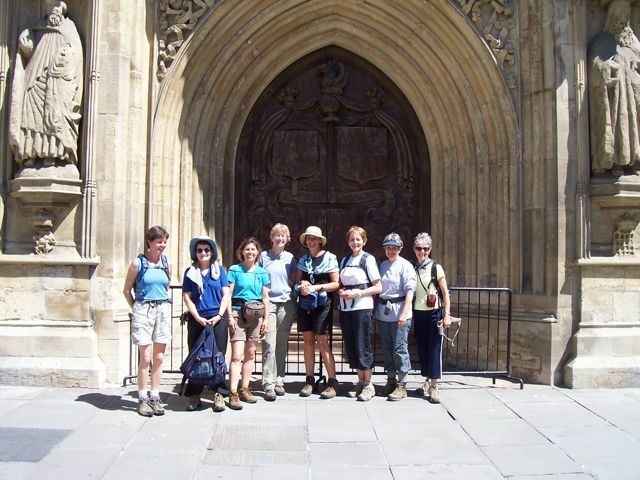 A pilgrimage is a setting aside of one’s normal routine, and taking time to reflect on what the Lord is saying, and allowing the rhythm of the walk to give mental and spiritual refreshment. It is a physical expression of our spiritual journey with God; it is a time to enjoy the beauty of God’s creation in the company of others; and it is a desire to spend quality time with God in a new way. It is a vacation with a difference. Penelope has led this pilgrimage 5 times. The next Cotswold pilgrimage is being planned and will be led jointly by Kim and Penelope. We are also able to lead specific groups, who would like to do this together, such as a home group or church leadership group. Please contact us if this is of interest to you, to discuss dates and prices. DAY ONE: arrive at Chipping Campden. We stay in the middle of the historic and famous market wool town; most of the buildings are 15-17th Century. We will enjoy the first devotional time in the evening and begin to get to know one another. DAY TWO : after a full cooked breakfast (we will have it every day!) we begin the Walk, enjoy amazing views from Drover’s Hill, climb the Broadway Tower, and drop down into Broadway, another historic and beautiful village with an eclectic array of delightful coffee shops! We walk on through picturesque Stanton, and delightful Stanway with its glorious Jacobean House which hosts the tallest gravity fountain in the world; have a peek at historic Hailes Abbey and arrive inWinchcombe – where we might well eat world renowned sausages at supper…..
DAY FOUR: A beautiful walk today through ancient hunting woods and then up over a golf course with far ranging views to the Severn Estuary and Wales. We arrive in Painswick where the coaching inn was built in 1554 and has views across St. Mary’s Church and churchyard with huge table top tombs and 99 topiary yew trees; legend has it that the 100th will not grow. DAY FIVE: A stiff walk with fabulous views, especially at Hetty Pegler’s Tump! And lots of opportunities to connect with the reality of God in creation. Then down into the tiny village of North Nibley . We stay either at a mediaeval inn which is reputedly haunted by ancient ghosts or at North Nibley House, a charming manor house dating from the early 18th cent. (this is a tiny village and has very limited options; but Nibley House rated as favourite of all accommodation by some people, it’s that special!) and we all eat dinner at the Inn. DAY SIX: a varied and interesting walk begins with climbing the Tyndale Monument, and giving thanks that we can read the Bible in English, then we explore the ancient wool town of Wotten-under-Edge with its old almshouses. Lots of amazing views again, and then through ancient English parkland on our way to Tormarten and an 18th Century coaching inn situated right on the Trail high on open countryside. Bath Abbey is an amazing and very special place to end our pilgrimage. We stay in a very historic building - Bathwick Gardens, Sydney Place. Dinner, bed and breakfast in a privately owned and run 4* BB. The house recently celebrated its 200th anniversary, and has been used in films (Persuasion & Vanity Fair among others) and has authentic ballroom and dining room. We will eat in the latter for a special celebration dinner! DAY EIGHT: Depart OR stay on and explore Bath at your leisure! The Pilgrimage ends officially after breakfast. EACH EVENING: We will have a special hour with worship, Bible study/talk, and prayer. EACH DAY: Whilst we walk we will have opportunity for discussion, learning of Scripture verses, singing praise songs, and quiet times for meditation. Luggage will be moved for us, so there is no heavy carrying. DISTANCES Please note that on some of the longer daily walks, we actually either take a short cut OR are taken part of the way by shuttle. (Sshh, don’t tell!!) 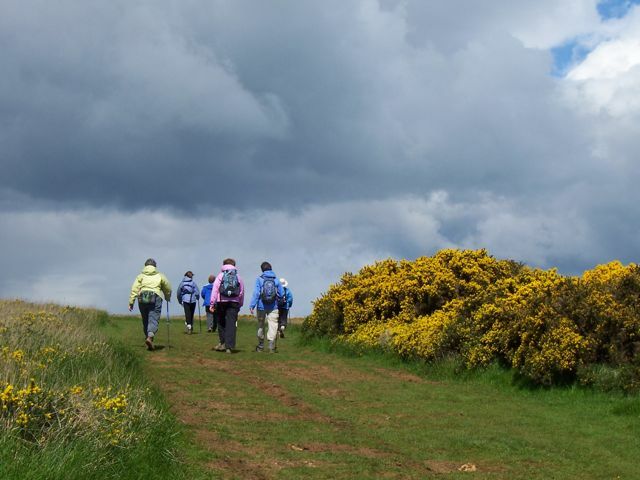 However, the Cotswold Way is very hilly terrain and you need to be able to walk up and down hills. 15 – 16 miles is the longest day of walking: but we do have all day in which to do it! Full details, including dates and price, will be available soon.